Woking slumped to their third defeat of the season at the hands of in-form Bath City, who inflicted considerable damage in the first half of a hugely disappointing afternoon for the Cards. Two strikes in the first twenty-two minutes of the match from the visitors left Woking reeling, and despite pulling a goal back from a Max Kretzschmar penalty, received what proved to be a knockout blow when Anthony Straker converted a penalty for the Romans seven minutes before half time. Taking three points back to Somerset, in the process leapfrogging Woking into 3rd place, was the least the visitors deserved for an enterprising, committed display, which contrasted sharply to the performance of the hosts. Alan Dowson made two changes from the starting line-up which secured Woking an FA Cup 1st round trip to Torquay United last week. Jamar Loza, described as 50/50 by Dowson prior to the match after picking up a shoulder injury against Welling United, presumably failed his late fitness test and was replaced by Paul Hodges. In the centre of midfield, Charlie Hester-Cook dropped to the bench in favour of Donovan Makoma, who was cup tied against the Wings. Kicking off attacking the Kingfield Road End under overcast Autumnal skies; Ian Gayle, Ben Gerring, Jack Cook and Josh Casey lined up in a back four ahead of Craig Ross in goal. Makoma and Toby Edser provided a central midfield platform for the more advanced Kretzschmar on the right, Nicky Wheeler on the left, and Hodges through the middle, with Jake Hyde operating as a lone striker. Woking looked to play on the front foot early in the game, and a positive start looked likely when a typically direct run from Hodges in the first minute was ended abruptly following a strong challenge from Jack Batten. The challenge earned the big centre back a yellow card, and left the former Bristol City man walking a disciplinary tightrope for 89 minutes. This was a rare error on the day from Batten, who was otherwise excellent, along with his partner Robbie Cundy. Bath took an early lead in the 6th minute, in front of the Leslie Gosden Stand. A fantastic strike from Joe Raynes, in the starting line-up for the visitors having started on the bench in the cup defeat at Weston-super-Mare, cannoned off the cross bar with Ross beaten. Unfortunately for the Cards, the ball fell to the alert Adam Mann, who turned home from close range with the keeper still picking himself up from the turf. Worse was to follow in the 22nd minute, in similar fashion with the Romans again first to a rebound off the crossbar. Josh Casey will have been disappointed to allow the cross to come in from the Cards left, the ball was met at the far post by Stearn, who nodded against the woodwork. This time it was the centre back Cundy who had the straightforward job of heading home. Woking had been unable to get any real foothold in the game in midfield, lacking any real forward momentum. However, Dowson shuffled his pack tactically and the hosts benefitted in the 30th minute. Kretzschmar, who had started on the right hand side and was finding it difficult to make an impression on the match, was moved infield with Hodges heading to the right flank. This paid off almost immediately, when a typically exciting direct run by the diminutive forward was only ended when felled in the box. Kretzschmar stepped up to score the spot kick, firing home to the keepers left to raise the home team’s spirits and lift the Kingfield Road End, for his eighth goal of the season. These increased spirits were soon dampened in the 37th minute when Woking pressed the self-destruct button, appealing for an offside decision against the visitors that didn’t materialise. Whilst the Card’s appealed, Ian Gayle rushed back in an attempt to avert the danger however bundled over Adam Mann in the box. The resulting spot kick was calmly dispatched by Bath skipper Anthony Straker, who wrong-footed Ross to slot home. Unsurprisingly, given the lacklustre display in the first 45 minutes, Dowson sent out the Woking team out early for the second period, and with a replacement in the form of Duane Ofori-Acheampong, who came on for Wheeler, who was unable to influence the proceedings in the first half. Ofori-Acheampong came on to partner Hyde and made an impression, putting himself about and trying to unsettle the Bath backline. It was Bath though who had the first chance of the second period, when Gerring mis-controlled allowing Mann to nip in and spread the ball left to Ross Stearn. Thankfully for the Cards, the former Sutton man sliced his shot wide of Ross’ near post. Woking began to exert some pressure on the visitors’ goal, good work from Casey and Ofori-Acheampong seeing a cross deflected wide for a corner, whilst Hyde had a shot blocked on the turn at the edge of the box in the 59th minute. The Bath keeper, Ryan Clarke, was largely untroubled, and dealt well with aerial balls into the penalty area. In the 61st minute, Dowson made a double substitution in a bid to get back into the contest. Hyde and Makoma made way for Greg Luer and Charlie Hester-Cook. Luer did well on coming on, looking bright and lively, and in the 71st minute some nice interchange between him and Kretzschmar saw the Cards top scorer strike the base of the post, probably the best effort of the match from Woking. In truth, the rest of the match rather petered out from a Woking point of view, the Cards unable to carve out any noteworthy chances, being restricted to long range shots from the likes of Edser, Hodges and Kretzschmar, which rarely threatened. Four minutes of additional time did little but delay the inevitability of this defeat for Woking, beaten by a Bath side that were by far the more impressive team on the day. Sadly, Woking looked disjointed, lacking experience and pace in the side as well as self-belief. 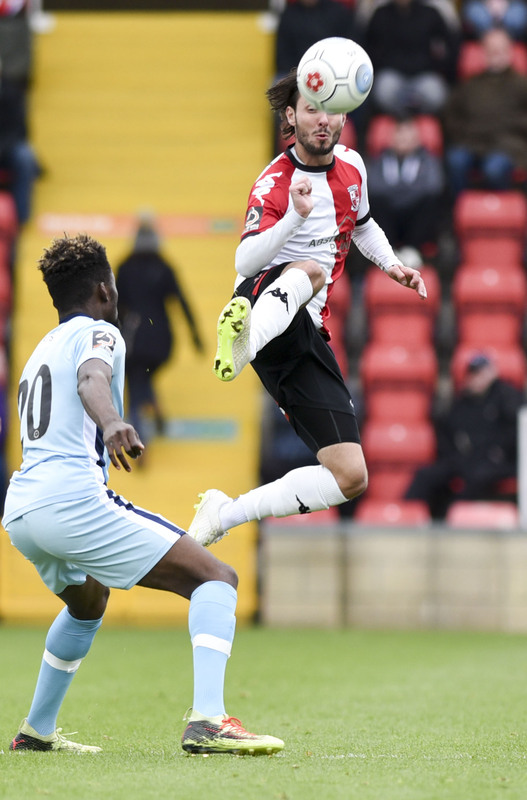 Without a league win since the start of September, Woking have clearly struggled with injuries during that period, and this was evident today, notably missing the on-loan Oxford duo Little and Bradbury, the pace of Jamar Loza, as well as experienced long-term absentees like Kane Ferdinand, Christian Jolley and Charlie Wassmer. The Cards need to put these concerns to one side and find a way to reverse recent league fortunes, starting with the home match with Hungerford Town on Tuesday night. Hear from Dowse following The Cards' 3-1 home defeat to Bath City.